Received3 November 2010; revised 5 November 2010; accepted 8 November 2010.
reaction method in the same AutoAnalyser. most unbiased and precise as possible. evaluation and management of renal impairment . time consuming, expensive and technically difficult. and is neither reabsorbed nor metabolized by the kidney. cation sec retory pat hways in the proxi m al tubule . nine , gender, age, and race for MDRDeq) [8,9]. ly question its use in pregnant populations . best approximation for GFR in healthy pregnant women. equations to predict renal function in pre gnancy. selected were between 20th and 30th weeks of gestation. by the local Human Research Ethics Committee. BSA (m2) = 0.007184 X height cm0.725 X weight kg0.425. mean age 32.06 ± 5.04 years were included in this study. 29.28 ml/min/1.73 m2. (Figure 1). ble 2, Figure 2 and Figure 3). Cockcroft-Gaulteq (b) and MDRDeq (c) during pregnancy. Creatinine Clearance (ClCr) X MDRDeq in normal pregnancy. 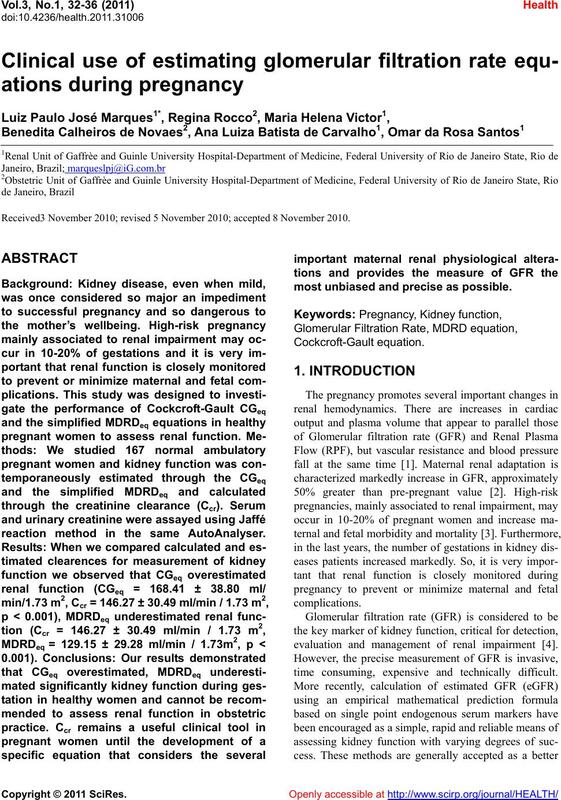 of pregnancy where the renal function is more stable. function in preg nancy . 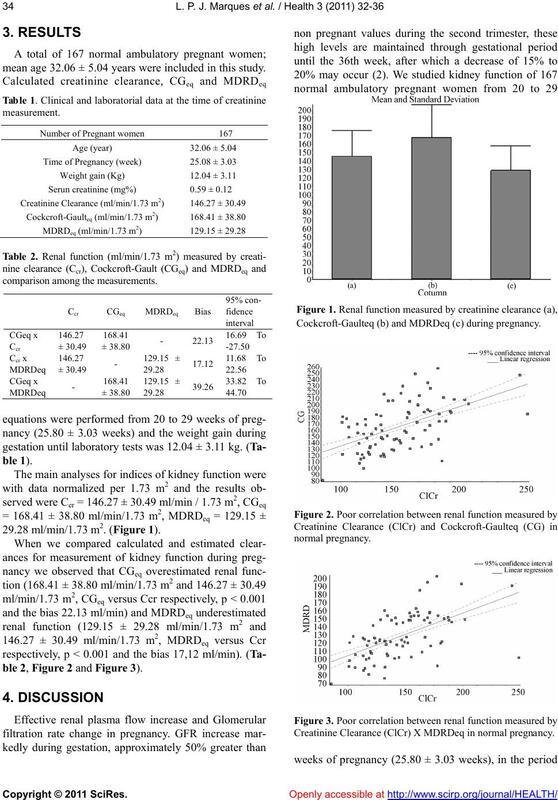 kidney function when compared with Ccr [14-16]. subsequent gestation and increase the body surface area. not capable to correct th is overesti mated resu lt .
pregnant women on whom GFR increases markedly. report the result as GFR > 60 ml/min/1.73 m2 [18,19 ]. 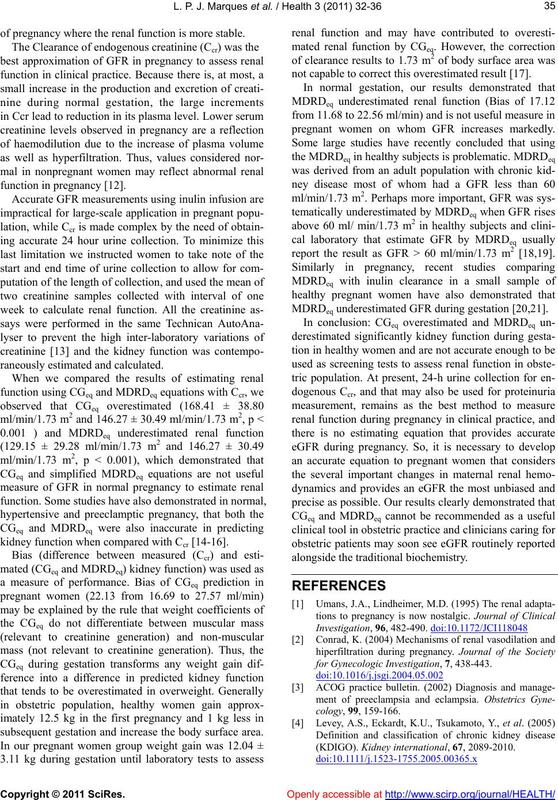 MDRDeq underestimated GFR during gestation [20,21]. for Gynecologic Investigation, 7, 438-443. (KDIGO). Kidney international, 67, 2089-2010. Kidney Diseases, Bethesda, Maryland, USA. Shemesh, O., Golbetz, H., Kriss, J.P. and Myers , B.D. Factors other than GFR affect serum cystatin levels. 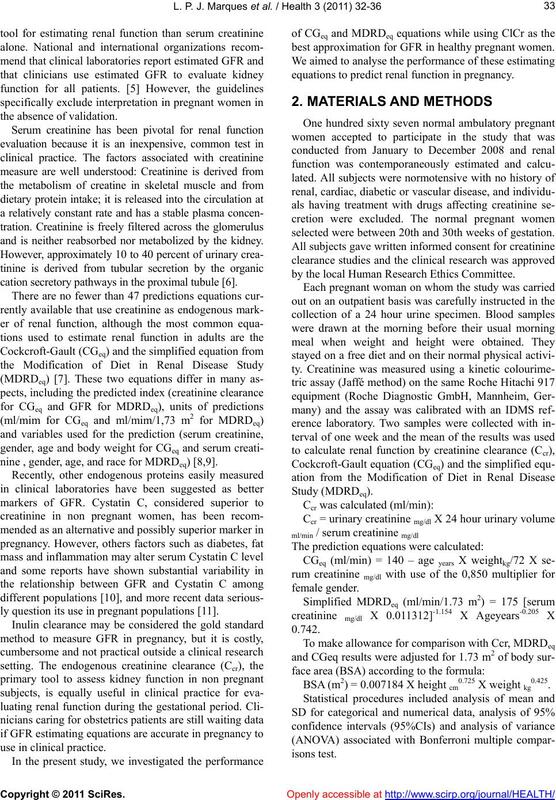 Akbari, A., Lepage , N., Keely, E., Clark, H.D., Jaffey, M.
of Obstetri cs Gynecology, 112, 575 -578. MDRD formula in pregnancy. BJOG, 115, 1192. 22-26 May 2009, poster Su. 197.
tensive pregnancy. Hypertens Pregnancy, 29, 318-29. A.A., Saade, G., Morgan, J., Nuwayhid, B., Belfort, M.
 Stevens, L.A., Coresh, J., Deysher, A.E. 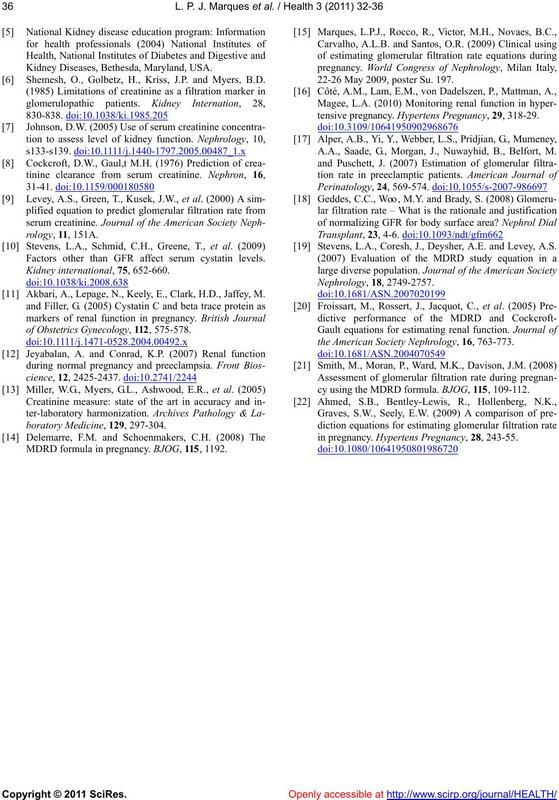 and Levey, A.S.
the American Society Nephrology, 16, 763-773.
cy using the MDRD formula. BJOG, 115, 109-112.
in pregnancy. Hypertens Pregnancy, 28, 243-55.